Images of different modality are registered using a unimodal image registration program (“Patch Algorithm”). An affine model for the displacement field is considered. Prior to registration the images are convolved with a set of Gabor filter (quadrature) pairs tuned to certain orientations and scales, and a gradient of local phase (local frequency) is computed for the filtered images. Local frequency representation of an image is relatively insensitive to changes in illumination conditions, and may enable common features between images of different modality to be captured. To demonstrate the algorithm, a series of 2- dimensional T2-weighted magnetic resonance images of brain was registered against a T1-weighted reference image. 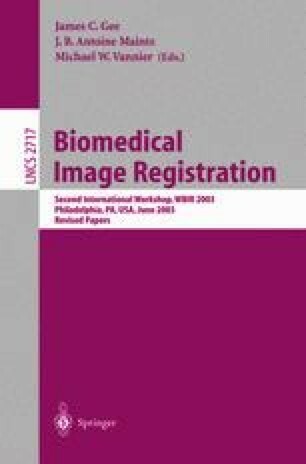 Also, registration of a near infrared hyperspectral datacube was shown to improve recovery of localized skin chromophore features for facial imaging, demonstrating its potential to obtain high spatial resolution diagnostic information.